A dear friend of Porcelains and Peacocks refers to deer as "rats in high heels" because they dine on his perfectly landscaped property. P & P is seduced by their graceful independence. Many cultures have viewed them as supernatural; the Celts believed they were connected to the fairy realm. 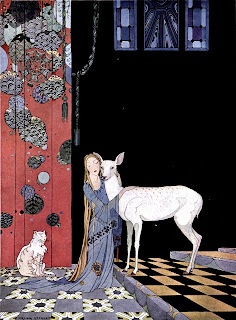 American artist Virginia Frances Sterrett (1900-1931) illustrated the fairy tale Princess Blondine with the cat Beau Minon and his mother, the deer Bonne-Biche. 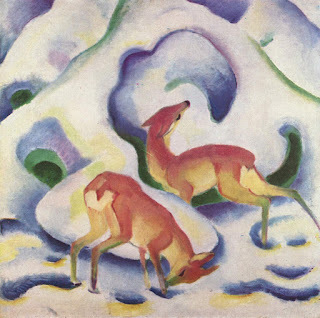 Franz Marc (1880-1916) was a German Expressionist who is remembered for his vibrant renderings of animals including deer. 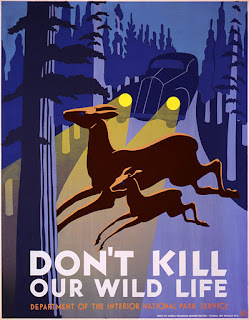 A WPA poster created in the late 1930's reminds us Don't Kill Our Wild Life, especially those controversial deer.